I hope everyone is having an amazing weekend. Sunday is typically my rest and recover day. I love having the day to workout, run errands, blog, get creative in the kitchen, catch up on Netflix tv shows. Today we had our last softball game of the season, before the playoffs. Let’s just say we refer to ourselves as “The Little Rascals.” I mean I should have known the teams we would compete against would be pretty impressive since this was the pre-season to Summer league. Oops. Don’t get me wrong, I am super competitive and love being active, but I am no Babe Ruth. Our record was 1-4 prior to today’s game. Not only was it difficult to piece together enough players today, but it was pouring rain. We have had such a mild winter, I really should not complain about one day of rain. Standing outside for an hour, getting soaked, chasing around a neon ball…not quite R&R if you know what I mean. Oh well, it was totally worth it! We won :o) It has been awesome to see how our team has come together through the season and it was a close game, which kept things interesting despite the weather. There is no better feeling than winning after bearing the elements. Okay, well in my honest opinion…there is no better feeling than a hot shower and cozy meal after a rainy day, but winning was the cherry on top of the sundae (Sunday, get it?). What does this have to do with my shrimp & farro salad? Absolutely, nothing. But this salad is a winner in my books. It’s light and refreshing. Packed with flavors, textures, and vitamins. Farro is an awesome grain to throw in soups and salads, because it will maintain its texture/bite and is larger than quinoa or cous cous. 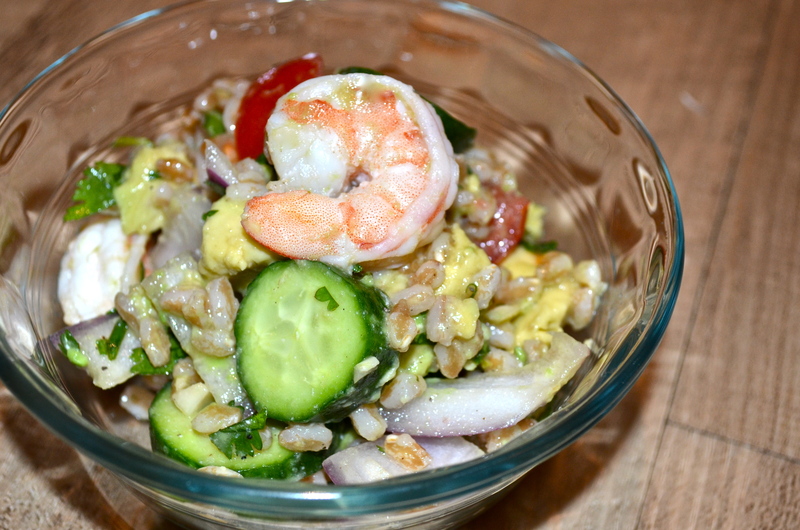 However, if you don’t have farro, you can easily substitute pasta or quinoa. 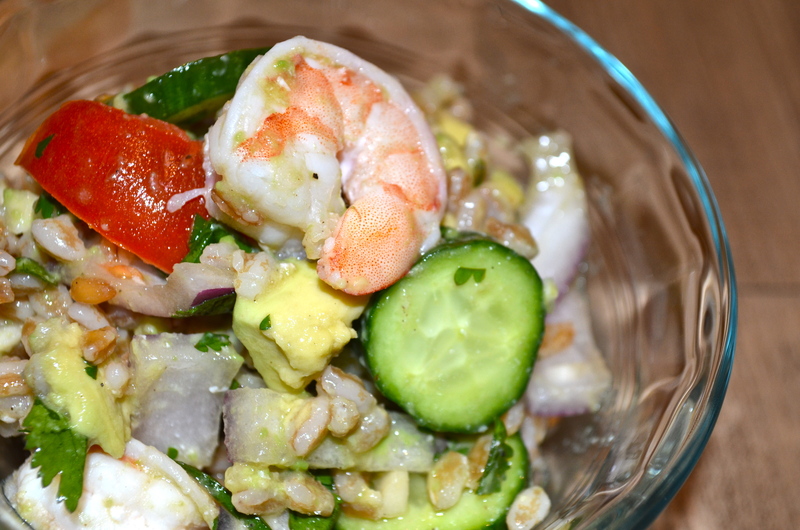 You will feel great eating this salad and I bet you won’t be able to put the fork down. 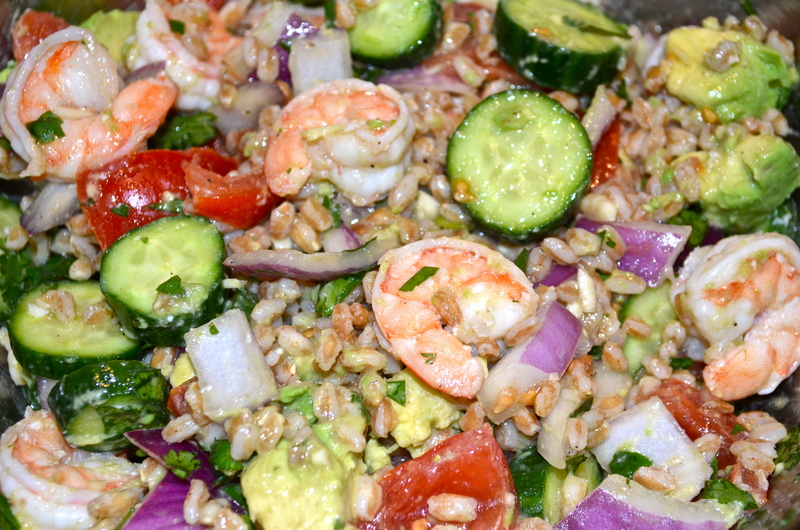 Place farro in a medium sauce pan with 1 1/2 cups water and salt and bring to a boil. Then reduce to a simmer and replace lid, cooking for 15-20 minutes until liquid is absorbed. Allow farro to cool (~ 1 hour). Remove tail and shell of shrimp. Rinse and dry with paper towel. In a large sauté pan over medium-high heat, melt 1 tbsp coconut oil and add shrimp. Season with salt. Cook for 2-3 minutes per side until pink and cooked through. 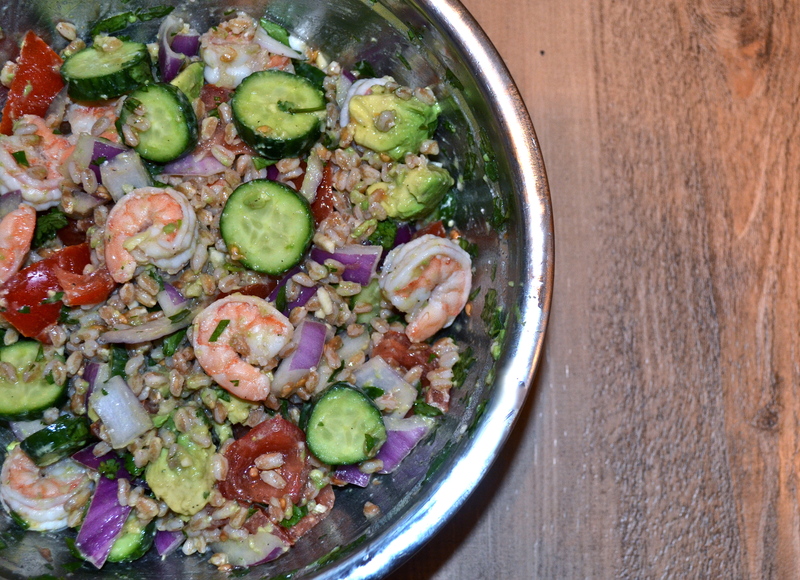 In a large mixing bowl, combine the cooked shrimp, farro, and remaining salad ingredients. Toss with a spatula to maintain some shape to the avocado. Taste and re-adjust seasonings as desired. Store in an airtight container in refrigerator.